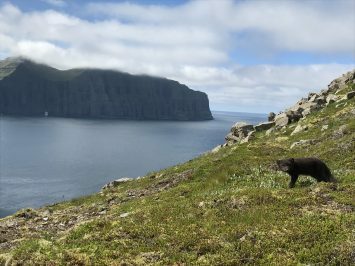 Hornstrandir Nature Reserve (established in 1975) in the Westfjords is known for its remote setting and dramatic landscapes. The 580 km² nature reserve is only accessible by boat during the summertime as there are no roads. The nature reserve is an incredibly remote area with no services so travelers must be entirely self reliant. 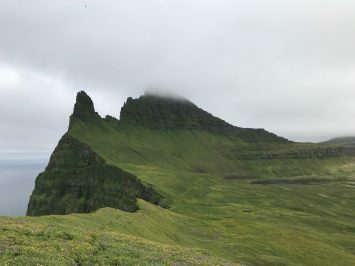 In this article we will provide you with information for planning your hiking trip to Hornstrandir Nature Reserve. There are no roads in the nature reserve so you must travel there by boat. 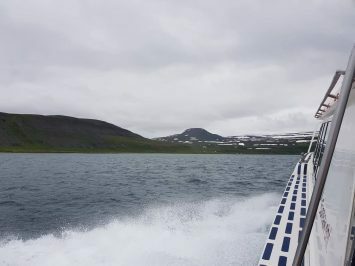 There are 2 companies, West Tours and Borea Adventures running a ferry service from Ísafjörður to 6 areas in the nature reserve and back. The ferry does not go to every location every day so you must plan ahead and book your tickets in advance. Request stops can be done at an extra cost but you must discuss this with the boat operators before your trip. Sometimes the boats are late so you must be prepared to wait a bit longer. Storms could cause a delay so you must have extra food rations in case you are stuck in the reserve for extra days. Please be advised there is no cell phone reception in the nature reserve (with the exception of some mountain passes) so it would be difficult to contact the companies to make changes while in the reserve. It is a good idea to take a picture of the ferry schedules before you leave in case you need to leave the reserve early. 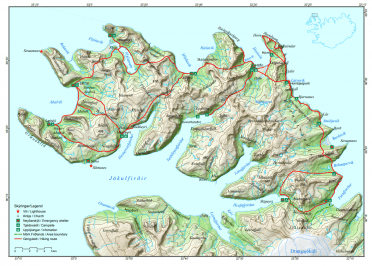 From April 15th to June 15th each year all travel within the nature reserve must be reported to the Hornstrandir information office in Ísafjörður in advance. Their number is 591 2000. You must report travel at this time as the area is very sensitive due to thaw and can easily be damaged. Large groups are not permitted to go there at this time. While hiking in Hornstrandir Nature Reserve you will be camping in designated campsites only. Accommodation is very limited in the nature reserve. 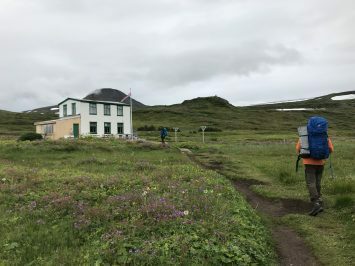 There is a guest house in Hesteyri in the Old Doctor’s House and a mountain hut run by Ferðafélag Íslands in Látravík called Hornbjargsvíti. 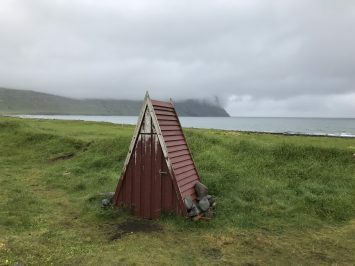 Most campsites are equipped with a latrine but some have flush toilets such as the campsite at Höfn. 9 of the campsites have an emergency shelter nearby but these can only be used in case of emergency. 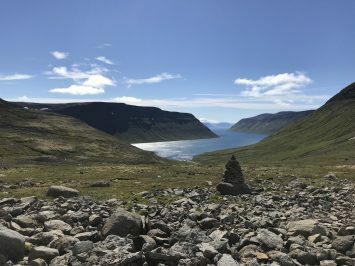 Trails in Hornstrandir are marked with cairns and are fairly easy to follow however in the mountain passes fog is common and the cairns can become difficult to spot. We recommend a GPS so that you can find your way in case of low visibility. People that plan to hike in Hornstrandir should at least have a compass and map and knowledge and experience navigating with these. Terrain varies greatly in the nature reserve. You should be prepared to walk on snow, mud, rocks, sand, steep inclines, steep declines and crossing many smaller streams and larger rivers. Some streams are easily crossed by walking on rocks in the river however others will need to be waded so it is a good idea to have river crossing shoes with you. Because of this we do not recommend bringing children to the nature reserve for longer trips. Check topographic maps to see the elevation that you will be required to hike over. You must also consider that you will carry everything that you need on your back so backpacks can easily be 15-20kg. Your experience will depend heavily on the weather which is very unpredictable in this area. Since the area is a nature reserve we ask that you remain on the marked trails and avoid making marks in wet sensitive areas. Do not trample the moss and under no condition may you burn anything. The nature reserve is mostly privately owned so it is important that you respect other people’s land that you are using. There are some summer houses on the island, please be respectful of the people staying there as it is their land. You will meet wildlife in the park as there are lots of bird species there. Arctic foxes are very commonly spotted in Hornstrandir. Take care not to leave any trash out at your campsite and do not feed the animals. Remember that you are walking in their home so you must clean up after yourself. 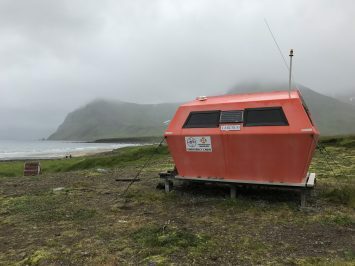 Information is available in Höfn and Hesteyri and from the hut warden in Hornbjargsvíti but other than this you must be fully equipped to deal with everything on your own. You may meet some wardens while hiking around Hornstrandir, always ask for updates on conditions and weather when you meet them. Even the best prepared hiker can find themselves in challenging conditions. To travel in the nature reserve you need to have the right mindset. It is likely that you will get very wet at times and be uncomfortable from the cold. You may have to hike up a very steep area with a heavy backpack. You may walk for hours in the fog and see very little. 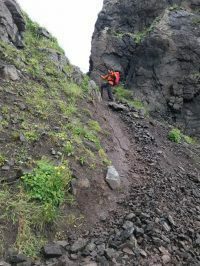 This is a part of hiking in a wilderness area in northern Iceland. 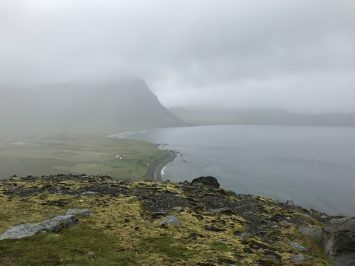 If you are not prepared to face challenging conditions we recommend choosing a hike with more facilities along the way such as the Laugavegur hiking trail. We have equipment lists for hiking in Iceland available here. But we want to emphasize the importance of rain proof gear and good boots while hiking in Iceland. Your boots should have good ankle support and be waterproof. We also recommend good quality wool hiking socks. If you spend a few days in the reserve you are very likely going to get wet at some point. Wool continues to insulate even after its wet and its dries relatively quickly. Stick your damp socks at the bottom of your sleeping bag to dry overnight. Camp shoes are great for letting your feet air out and giving them a break from your heavy boots. Bring extra batteries or an external battery pack with you so you can charge any essential devices such as your cell phone and GPS. If you have an emergency and you need to call 112 you will likely not have phone service. In this case we recommend you send an SMS to 112 as it is more likely to go through than a phone call. You can also use the 112 app to contact emergency services. The app will send your GPS coordinates via SMS to the police if you press the emergency button. We also recommend you carry an emergency beacon with you such as a personal location beacon. Safetravel rents personal location beacons for 1200isk per day. You are permitted to stay in an emergency shelter only in case of emergency (ex. illness, storm). If you stay in the shelter sign the guestbook with your name and travel itinerary. There is a radio located in all the emergency shelters that can be used to contact emergency services. Our best advice for hiking in Hornstrandir is prepare for the worst but hope for the best. If you have any questions feel free to contact us for help planning your route or for more information.